Posted on Thursday, April 18th, 2013 at 6:48 am by Pieter van der Westhuizen. Outlook views allow you to group, sort and view all the different types of Outlook data within the View panel of the Outlook Explorer window. Outlook comes with a few built-in views for each Outlook item type (mail, task, calendar, etc.) which can be accessed via the View tab. TableView – Allows you to view data in a simple table/grid layout. IconView – Shows data as icons in a similar fashion as the Windows Explorer icon view. BusinessCardView – This view is synonymous with the Outlook Contacts folder. It allows you to view data as a collection of business cards. 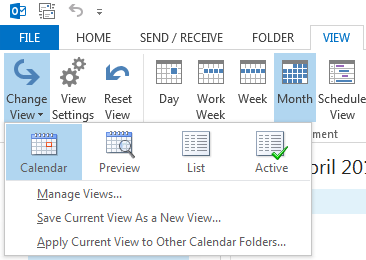 CalendarView – This is the default view used by the Outlook Calendar, but you can also use it to view other data. CardView – Allows you to view data as a series of cards. TimelineView – Shows data in a linear time line, similar to the Outlook Journal folder. You can create your own custom view using the Outlook object model. In the following code listing, I’ve added a user property to a calendar folder, created a new TableView for the folder and added the custom property to the view. These two events are similar in the fact that both are triggered when a view changes in the Outlook Explorer. However, as the BeforeViewSwitch event’s name suggests this event occur before the view is changed. To access these two events, you first need to add an Outlook Events component to the AddinModule designer surface. In this components’ list of events generate an event handler for the event by double-clicking next to its name in the properties window. In the above code, I get a reference to the new view the Outlook Explorer is switching to and if it is a standard view, I cancel the event. Thus preventing the user from switching to any standard built-in Outlook view from a custom view. The ExplorerViewSwitch event occurs after the user changed the view and has a parameter which contains a reference to the Outlook Explorer in which the event occurred. In the following code I use the explorer parameter to get a reference to the active Outlook Explorer and the currently active view. Part 4: Outlook UI – Explorer and Inspector Windows. What is customizable? But do you have any tip on how to display an icon in a Table View column ? like the “Icon” built-in column ? i.e. I’ve my custom property, I add a column in the view and set the view, but I only succeed to display text without any formatting. The link you gave show away to change the built-in icon for an item (by changing the MessageClass) but it doesn’t show a way to display an icon for a custom property. I think it’s simply not possible in outlook. is it possible to Bring Private key message button in new composing email. Could you please provide more detail of what you want to accomplish? What do you mean with a private key message? Any idea on how to assign it other than the example shows? I did test the example project on my system with VS2010 pro and Add-in Express .net premium in win7 (32) and office 2013. The code in the post has been updated to reflect this. Thanks so much for the changes. I was struggling with why the object was not being able to be reassigned after casting. Accessing it by the string value will work as well. I am interested in building on the above idea and making property “Billable” visible and update-able in both the main outlook folder and mail item level when the item is opened (or at least update-able in the main folder but visible in both). In a different blog, titled “Working with custom Outlook properties: C# code examples “ (https://www.add-in-express.com/creating-addins-blog/2014/01/15/custom-outlook-properties/), you explain how you can use the parameter AddToFolderFields (of the Add method) of Outlook.UserProperties to show custom fields at item and folder level. I am wondering if it is possible (and if so, how) to create user properties at item level and displaying them in a different way than using custom form as in your other example (for example by displaying them in a similar way categories are shown when a mail item (with one or more assigned categories) is opened? Please find below details for additional info. 3)	Select a mail item and add a user property “ColorId”. Set the third parameter of the add method of Outlook.UserProperties (AddToFolderFields) to true. 6)	Reading the value using the PropertyAccessor shows the assigned value at the item level. 3)	If there is a way to change the display name of the property tag (eg. “ColorId” to something else) in the custom view. I’m not sure I follow. If you follow the example, you’ll see we’re adding user properties using the UserDefinedProperties object and then adding them to the view using the viewFields object. The part to add user properties works fine. I was trying to accomplish something else, which on a second thought is beyond the scope of this article, so please consider this as closed. I will check it further and if necessary create a separate request/thread. Is it possible to set the Compact mode via code ? I could’nt find a way to do it in code. You could perhaps try setting the views’ XML property to the same XML of a view that has this property set and see if that will work?